As May entered in we concentrated most of our attention on what we were now calling the Lower Sluice. 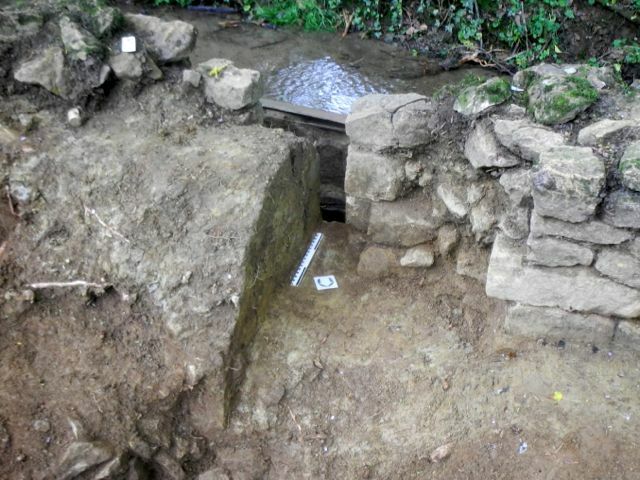 Unlike many of the areas we have examined to date this one seems to be packed full of archaeology but still no finds and indeed as a sluice it didn't make a lot of sense initially. 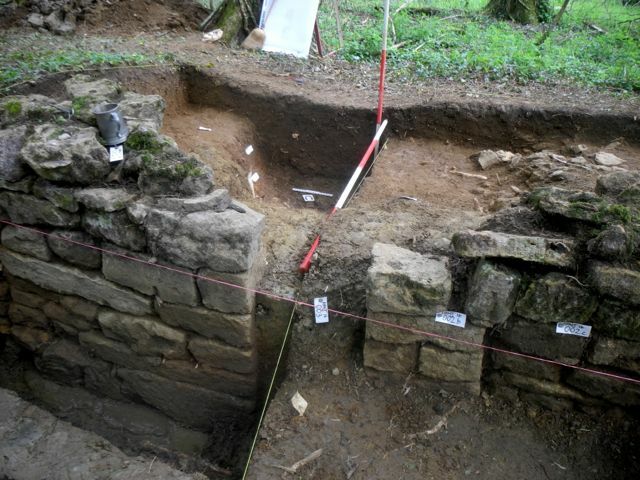 We dug down in front of the the western half of the wall and showed it to be, at least when next to the opening, very well built with up to 12 courses surviving. 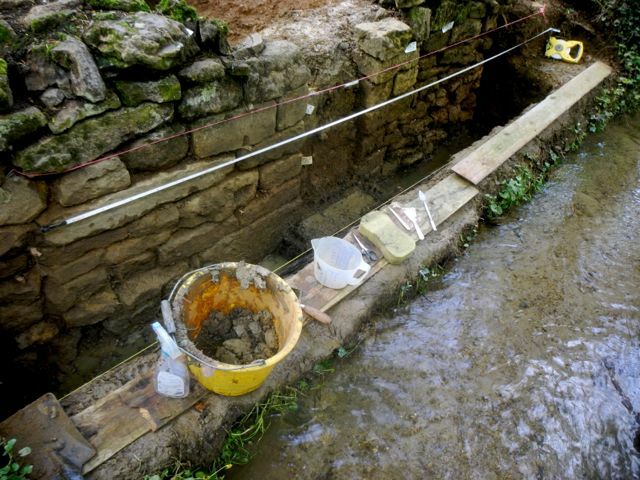 In addition Peter started to uncover some preserved timbers, presumably associated with the sluice mechanism. 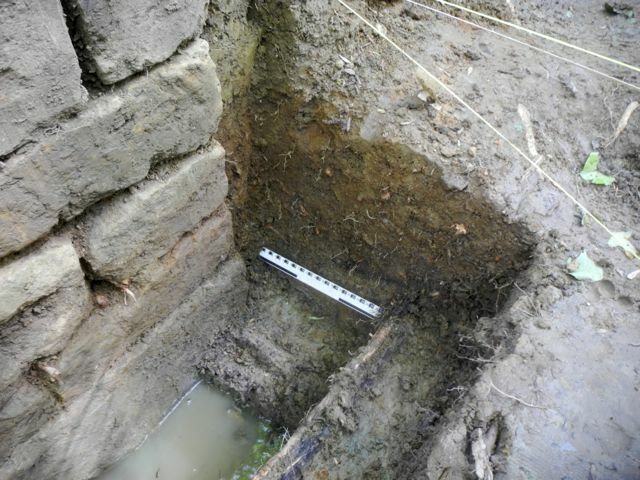 Behind the walling we half emptied the ditch that the LIDAR had shown running off to the north and found a suitably silty bottom but no dating material. This was all followed by some fairly intensive form filling then plan, section and elevation drawing plus we spent a rather frustrating hour or more taking levels from a fixed point up on the top of the dam to the west down to a temporary site datum on one of the more stable looking stones. 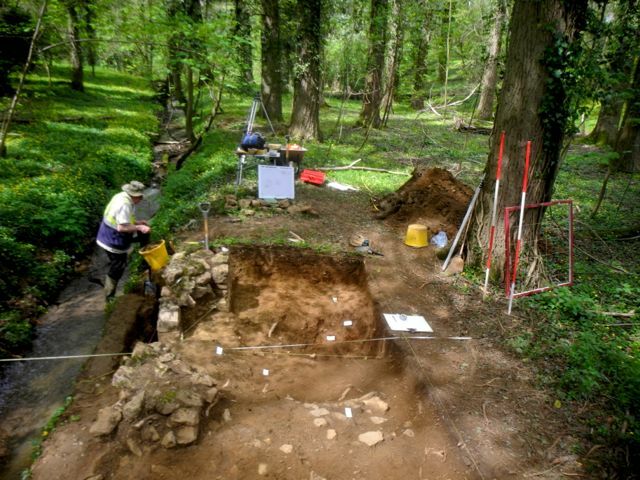 Once that was all done we started on excavating down in front of the eastern section of walling and emptied the other half of the ditch. 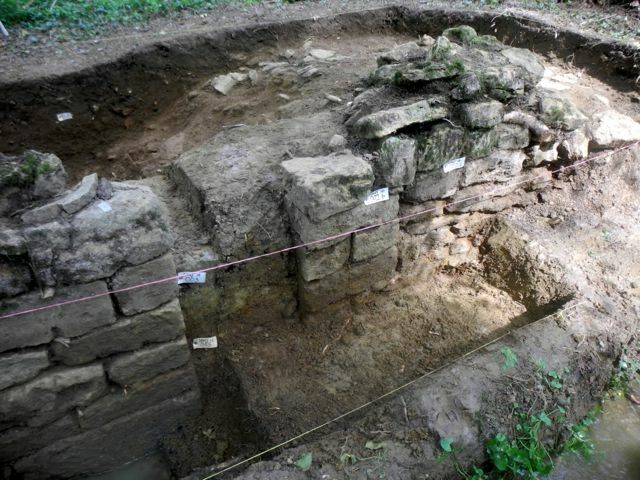 This seems to be lined along its eastern side with quite a lot of rubble that has slumped down possibly from some yet unidentified structure to the east. 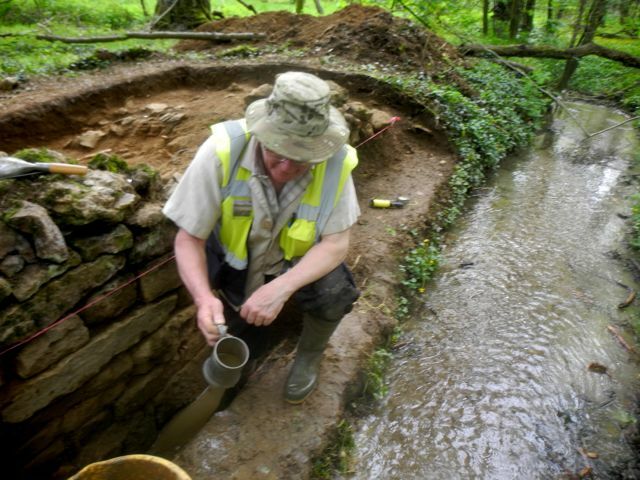 We are now digging well below the level of the stream and occasional bailing out is required. We need a lot of equipment to work effectively and it has to be carried down and carried back. First sight of timber work in front of the opening, view looking north east. New courses of walling appear on the eastern part of the walling, view looking north. 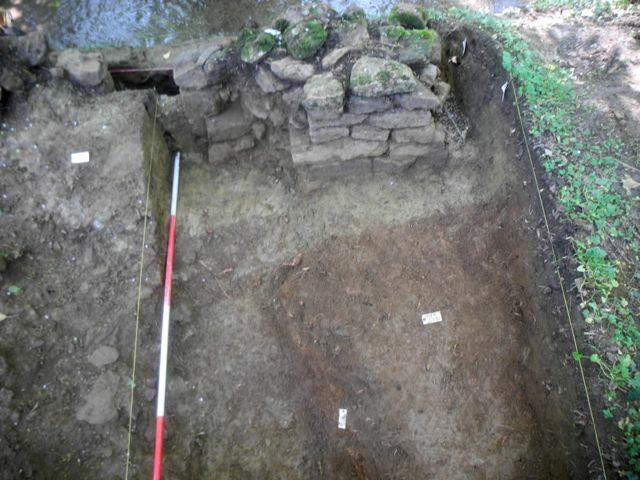 Further work revealed a wall which continued to plunge downwards and a perplexing relationship between ditch, wall and clay bank. 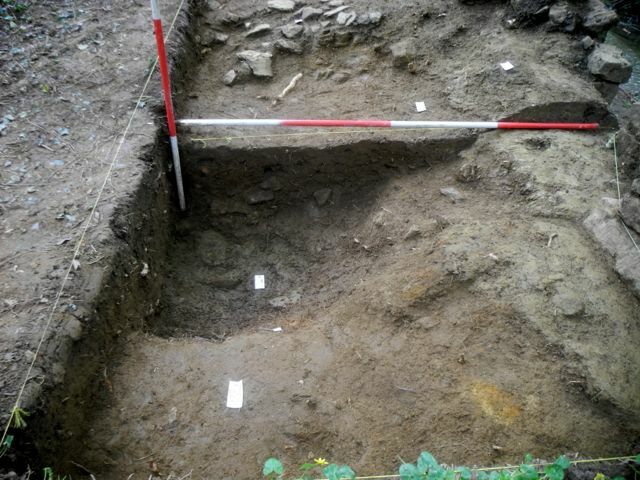 Eventually we made a start on removing the rubble tumbled into the ditch in the hope that a further structure to east might be revealed, no such luck. 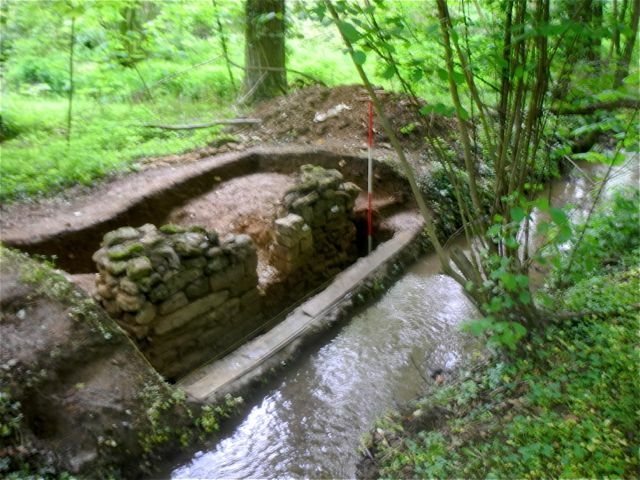 On the other hand the timber work continued to grow in complexity but it is still hard to really identify how anything functioned down in our sluice... if indeed it is a sluice. 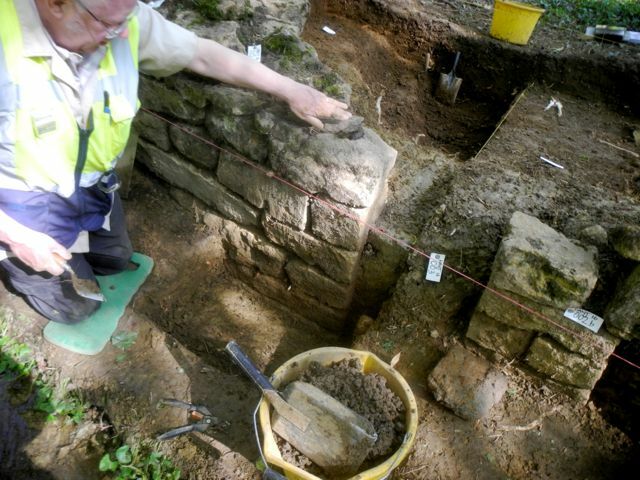 Peter crammed into an increasingly narrow space in front of the eastern portion of wall. 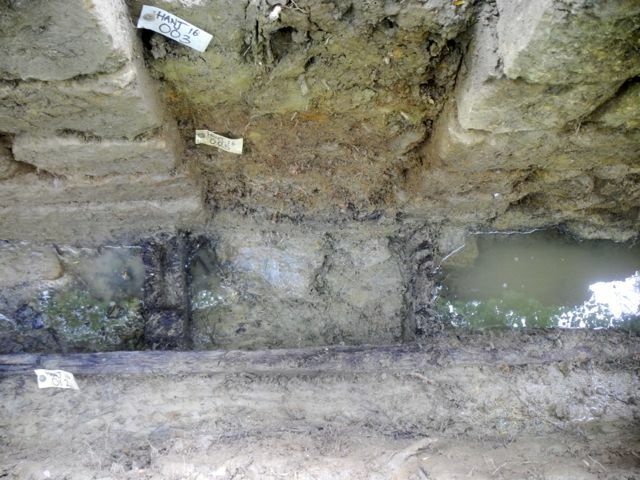 The ditch comes in from the bottom and meets the clay bank but we still have to clarify their relationship. Time to start giving the timber work a meticulous clean, the tools of the trade are spread out. Making progress, the timber upright to the left has a mortise cut in it and the central channel seems to have a stone base. ... and yes we are working well below the level of the stream. 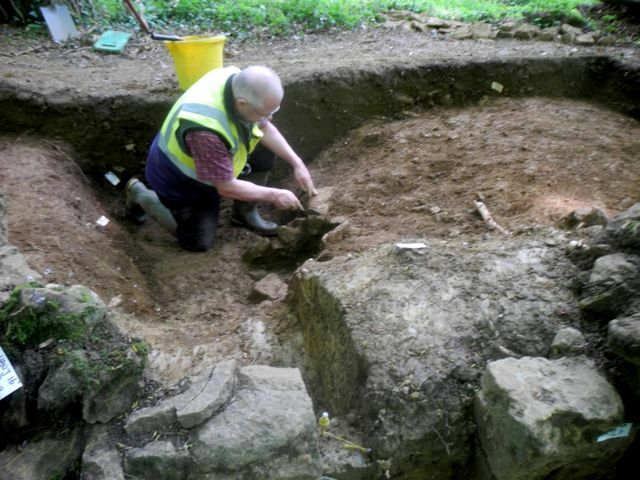 Peter continues to explore the rubble bank and discovers a structure! 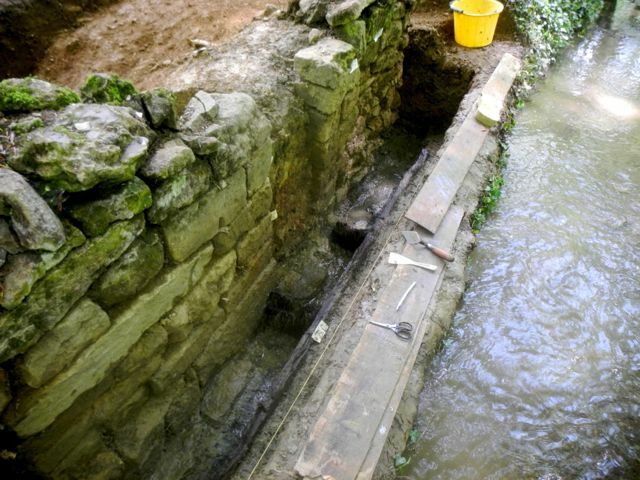 Possibly a post setting whilst next to the stream work continues to clean and expose the timber work. 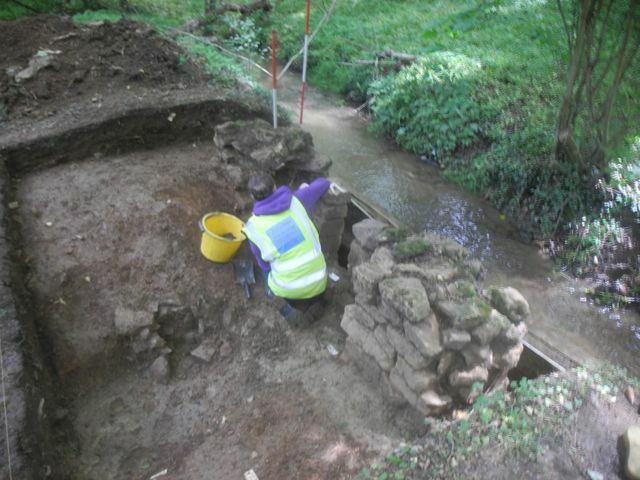 The section was extended to show the full extent of the clay blocking bank and Helen works to remove the last of the clay from behind the eastern section of walling. By the end of the month we have certainly exposed some serious structural evidence for a.... what? Well it remains an open question but we're still calling it a sluice.